The New York Times may be the day paper of record, but that doesn't mean it's immune to making the occasional blunder. 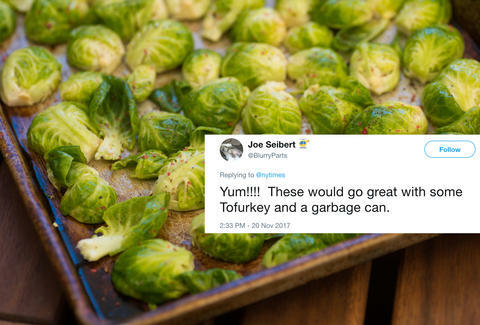 And while the Times has courted controversy in the past for its coverage of everything from presidential campaigns to national security, a new and arguably lesser-stakes brouhaha over a seemingly innocuous Thanksgiving recipe has nonetheless prompted the internet to take sides. It's also exposed a shocking truth: some people really, really don't like Brussels sprouts. It all started after the official New York Times Twitter account re-promoted a years-old recipe from its Cooking site for Brussels sprouts "sliders," which calls for the bitter green veggies to be sliced in half to serve as the "buns" on either side of a savory tempeh and mustard filling. The paper went so far as to recommend them as a new "favorite" and perfectly seasonal Thanksgiving appetizer. The reaction on Twitter was swift and, well, mostly negative -- an equal blend of outrage of disgust -- that eventually snowballed into a cacophony of hilarious reaction GIFs. I don't think you know what "favorite" means. Yum!!!! These would go great with some Tofurkey and a garbage can. Amongst the army of haters, a handful of Brussels sprouts supporters came to the recipe's and the NYT's defense. I dont think they would be that bad! These look amazing!! Brussel sprouts are associated with Thanksgiving to me, so thanks for the idea! Frankly, the defenders are few and far between, but they do exist. And to be fair, this meatless "twist" on the traditional slider is nowhere near as misguided as that godawful green pea guacamole recipe NYT Cooking recommended a couple years ago. Even President Obama thought that was disgusting.